Twitter avatars of Mubarak Al-Bathali (left) and Nasser Abul in a blue t-shirt (right). Nasser Abul (@NasserAbuL) was the first to get arrested for his tweets. He had a long timeline filled with insulting tweets of the Sunni sect and severe criticism and insults to the Saudi and Bahraini regimes for their stand against the Bahraini protests. Salafi Parliament member Walid Al-Tabtabai (@Altabtabie) was the first to post snapshots of Abul's tweets and demand his arrest, which eventually put the controversial parliamentarian, once again, under fire from the Shia community inside and outside Kuwait. Abul has spent three months between State Security Police and the Central Prison waiting for his trial and two of the charges against him were “insulting a religious sect and insulting neighboring regimes”, in reference to Bahrain and Saudi Arabia. On the 27th of September, Kuwaiti court found Abul guilty of insulting a religious sect and sentenced him to three months in jail, which he already served, and set him free. It is worth mentioning that Abul has denied writing the problematic tweets saying that his account has been hacked and when asked about his twitter avatar with the Bahraini flag he said that he was in a Kuwaiti protest in support of the Bahraini uprising. Another arrest case of a twitter user happened to a very controversial person called Mubarak Al-Bathali (@mubaark) who has been previously linked with Al-Qaeda and of fundraising money and recruiting men for them through his speeches and visits to different mosques years ago. Al-Bathali openly declares his support of Al-Qaeda but has dedicated himself this year through twitter to being an anti-Shia fanatic with a very insulting tone of language. Locally, Al-Bathali is known for his frequent visits to State Security Police, and this year several Shias filed complaints against him for his tweets. Eventually, Al-Bathali was arrested and he did not deny what he wrote saying that he completely stands for his beliefs, so he was sentenced to three years in prison, which was eventually shortened to six months, for threatening national unity and insulting a religious sect. The third case is the most mysterious one as Kuwaiti mainstream media avoids talking about it in details. It is the case of a man called Lawrence Al-Rishidi who was arrested for insulting the Kuwaiti Amir (ruler) in a Youtube video, which has disappeared. The Amir, according to the constitution, is the only figure that cannot be insulted nor criticized and it is said that Al-Rishidi has asked him to step down saying that the Arab Spring will eventually reach Kuwait. 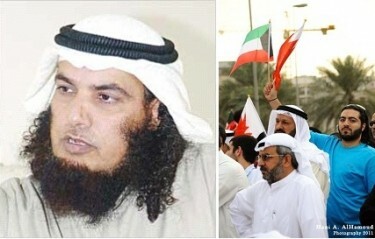 Human Rights organizations have several times issued reports demanding the release of Lawrence and the other two cases and no replies have been made by the Kuwaiti authorities. Latest local reports indicate that Lawrence tried to deny making the video. Several organizations and activists tried to reach him or his lawyer but nothing has been helpful.